It's finally here! You may have noticed Canyon Hearts has been for sale on the Kindle since January 23 or so, but as of February 22 it is also available in print. It's on sale until 2/25 to boot. Patti and I began work on this book three years ago, on a whim. I had been assisting her as critique partner and editor on her prior works in the fictional town of Echo Falls, Texas since 2006. During one of our IM chat sessions (she lives halfway across the country from me) she asked if I'd like to write a story with her set in this town. Would I?! Over 4-6 months we hammered out a decent first draft. Patti made the decision during this period to strike out on her own as an indie publishing venture with others in her family. 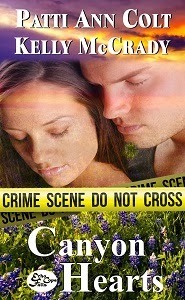 She wanted to rework and reprint her first three novels from the Echo Falls series under her own label before we could produce Canyon Hearts, which while it is a "separate" series is still book # 4, essentially; by contract, we would have had to allow the publisher first crack at it. This meant we had to leave it on the shelf while the rights to her first three novels reverted to her hands. I was fine with this, in no hurry; I wrote Canyon Hearts with her for fun. Once that reversion of rights goal had been reached, we dusted off the manuscript and began edits--but whoa! We had both grown in our abilities as writers and editor since the draft was completed, and we learned we'd left a lot of things until "later." From August to December we edited and revised, crafting a much stronger plot and cutting oodles of words--and whole scenes--only to replace them with more! If Patti will indulge me, I may post a few of our cut scenes to my website in the "Extras" page, the scenes set in the antagonist's POV, which we both felt weren't needed to tell the story. But they're still awesome. This is a contemporary romance with sensually explicit love scenes, so expect some of it to be blush-worthy. It will be available on Nook and Kobo soon.